Legg Calve Perthes Disease affects mainly small breed dogs and seems to have a genetic component. Has your dog been diagnosed with the disorder? Be sure to join the discussion below. The anatomy and description of this problem is not the most exciting read of the day, but with that said, let's look at what is causing these small dogs so much pain. Feel free to skip the anatomy, if you prefer. The hip is considered to be a ball and socket joint. The ball portion is the head of the femur (leg bone) and the socket is the hip or pelvis. This disease happens when there is an interruption of blood flow to the femoral head causing the bone cells to die and thus the the femoral head begins to degenerate. Also occurring in human children, this disorder is most common in small breed dogs and terriers. In dogs, the bone loses mass and the hip joint deteriorates causing pain and lameness and eventually the muscles in the affected leg will shrink. It is common in many small breed dogs and usually shows up between 4 and 12 months of age. Unlike children where it is more common in boys, both male and female puppies are equally vulnerable. It usually affects one hip, but in some rare cases it can affect both hip joints. Specific causes of the disease are not completely understood, but it is thought to be an inherited disorder, caused by an autosomal recessive gene that is inherited from both parents. Trauma may also play into the disorder. Since there is a possibility that it is inherited, no dog with his disease should be bred. You might also see it called Perthes Disease, Legg–Perthes Disease, or Legg–Calve-Perthes Disease (LCPD)—all are referring to this degenerative disease of the young. Other names that it goes by are “avascular necrosis of the femoral head” and “aseptic necrosis of the femoral head." Whatever you decide to call it, it means pain for your small breed dog. It was named after the physicians, Arthur Legg an American Orthopedic Surgeon, Jacques Calvé French Orthopedic Surgeon, and Georg Perthes, a German Orthopedic Surgeon who were responsible for identifying the disease. Basically almost all small breed dogs! They first signs that something might be wrong are limping and lameness, followed by a change in behavior, decreased appetite and possibly nipping at the skin around the hip area. The puppy might cry out when he puts weight on the hip or when it is being manipulated. These are all the result of the dog feeling pain. To diagnose the condition, the veterinarian will do a thorough physical exam and X-rays. Bed rest or cage rest is recommended initially, but usually surgery is indicated if rest does not help. The veterinarian also prescribes pain medicine for the puppy. Surgery can correct the problem and eliminate the pain and lameness. Prognosis is good with surgical intervention. The surgery is called a femoral head osteotomy. The veterinary surgeon will remove the dying bit of bone. What is left of the bone and muscles result in scar tissue that forms a “false joint.” The good news is that there are usually few complications and most dogs do great after recovery. Dogs usually make a full recovery after surgery providing that the owners stick with the rehabilitation recommendations. It often takes between three and six months for complete recovery. Regular exercise, physical therapy and diet management are three aspects of recovery. 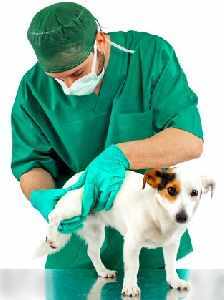 Veterinarians also prefer to see their patients about every two weeks to assure that they are making progress. According to Dr. Daniel A. Degner, Board-certified Veterinary Surgeon, activity should not be limited after surgery. Rather, it is recommended. Exercise helps the hip joint stay mobile and prevents adhesion from forming. Swimming, depending on the breed is a good exercise, but professional physical therapy services should be used where ever possible. Some vets will provide anti-inflammatory medications to help the dog move and prevent swelling and the accompanying pain.